So far, six teams around the world have verified that the EM Drive indeed produces a reactionless thrust. These findings have caused much consternation among physicists since reactionless drives by definition produce an action force, without a corresponding reaction force, hence they violate Newton’s third law. Recently, however, many physicists felt a sigh of relief when Michael McCulloch of Plymouth University published a new theory of inertia which purports to explain the reactionless thrust effect on the basis of a quantum physics concept called Unruh radiation which is theorized to be radiated by an accelerating body; see above cited links. This Unruh radiation theory has made some predictions which are yet to be tested. It was developed specifically to explain the EMDrive anomaly, hence has not ventured to explain any other reactionless thruster technologies. In this posting I wish to propose a theory that should be much easier to understand and that is applicable in general to several reactionless thruster technologies: Townsend Brown’s asymmetrical capacitors, the EMDrive, and the Nassikas thruster. It incorporates two novel concepts that differ from those of standard physics: a) the existence of an ether, b) a new theory of force advanced by the physics methodology of subquantum kinetics which departs from the mechanistic force concepts of the past. With this new concept, a field potential gradient is able to exert a force on the propelled object without itself communicating any back reaction. Let us begin by applying this to Townsend Brown’s asymmetrical capacitor. 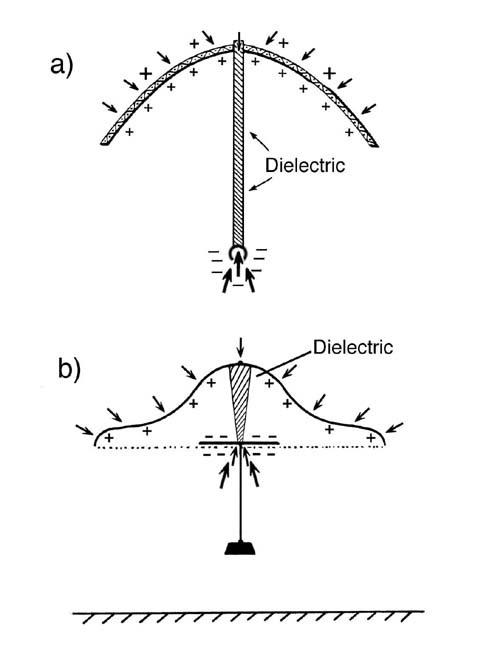 Figure 1 above shows two versions of Townsend Brown’s electrokinetic thrusters which reportedly were able to lift their entire weight plus a 10% payload when energized with pulsed high voltage DC (100 – 250 kV). Tests conducted under vacuum showed that the thrusters developed the same thrust with a 1000 fold lower current draw, thereby proving that their thrust did not arise from any ion propulsion effect. More about this technology may be found in chapter 3 of the book Secrets of Antigravity Propulsion. Both of the above reactionless thruster designs may be termed asymmetrical capacitors since one of their electrodes has a larger area than the other. When electrified, an electrostatic field extends between the upper and lower surface of the capacitor. This generated electric field will exert a force on the electric charges in the capacitor plates, pushing the minus charges upward toward the positive electrode and the positive charges downward toward the negative electrode. But since the area of the lower electrode is smaller than that of the upper electrode, the electric potential gradient will be steeper in the vicinity of the lower electrode, because the same amount of charge is confined to a much smaller area. Hence in that region a much stronger force will be exerted per unit charge. While both plates have the same amount of charge, the force pushing the negative charges upward will therefore be much greater than the force pushing the positive charges downward. This force imbalance causes the capacitor as a whole to propel itself upward. In the case where the upper and lower plates have the same area, the potential gradient in the vicinity of each electrode will be the same and the upward and downward forces will balance. In this case the capacitor will experience no net propulsive force, just a compressive force attempting to push the two plates together. This compressive force on charged capacitors is a well-known effect. Why the asymmetrical capacitor is able to propel itself upward without creating an opposite reaction force may be understood by using the reaction-diffusion system paradigm of subquantum kinetics, which employs a force concept different from that of standard physics. Standard physics espouses the classical force concept in which the force field is the real existent, i.e., a field of vectors extending between the capacitor’s positive and negative electrodes. Quantum mechanics instead regards energy potentials as having a real physical basis, in which case forces could be represented as vectored effects produced on charges due to the presence of local potential gradients. However, when it comes to representing forces, physics has stuck with the classical force field vector concept. Subquantum kinetics, like quantum mechanics, requires that the field potential be the real existent, and identifies it with the concentration of a specific ether species at a particular point in space, e.g., the concentration of G etherons when representing gravity potential or the concentration of X or Y etherons when representing electric potential. According to this subquantum physics, force, or its consequence — particle acceleration, is a response elicited by the destabilizing stress which an electric field potential gradient (an X/Y etheron concentration gradient) would produce on the space structure of a charged subatomic particle. We use the term space structure because particles are not point masses as standard physics conceives, but rather have spatial extension. They emerge as extended dissipative space structures (to use the terminology developed by Ilya Prigogine), or more accurately as “dissipative solitons”. A subatomic particle modeled as a dissipative soliton would consist of a periodic X etheron and Y etheron concentration pattern having a characteristic wavelength, this pattern being both localized as well as radially periodic. It is compatible with Einstein’s concept of particles being “bunched fields”, hence in this case a bunched periodic electric field. The particle would also have a magnetic aspect arising from its intrinsic vortical motion which we will not go into at this point. They say a picture is worth a thousand words, or in this case perhaps a computer simulation is worth a thousand words. By viewing such a simulation one is able to understand that all of the above details are not individual disconnected assumptions, but rather results that stem from the Model G reaction-diffusion system, this being a set of five kinetic equations that form the heart of subquantum kinetics and which may be represented by three partial differential equations. This ether reaction-diffusion recipe is what constitutes the fundamental set of assumptions in subquantum kinetics. An actual computer simulation of this system, which is shown below, spontaneously generates one such above mentioned dissipative soliton. Subquantum kinetics interprets this simulated particle to be the counterpart of a subatomic particle, in this case a particle of neutral charge such as a neutron. The second simulations below show how such a particle responds to a potential gradient in its environment, in this case a gravity potential gradient, φG (or G etheron concentration gradient), the gradient being seen to cause the particle to move. We expect that future simulations performed in a 3D space matrix depicting a 1/r field potential declining omnidirectionally from a specific center will cause accelerated motion of dissipative solitons residing in its vicinity. These simulations are shown here first to point out that these potential gradient effects on particles are derivative from the original assumptions and not ad hoc assumptions added to the theory. Also this ether concentration gradient simulation intends to show that in subquantum kinetics a field gradient causes a subatomic particle (dissipative soliton) to move because this gradient is altering the reaction-diffusion processes that are continually generating the dissipative soliton’s space structure. This in entering the world of subquantum kinetics, we depart from the familiar mechanistic force concepts of classical physics and enter a realm of ether reaction kinetics more akin to phenomena taking place in bio systems and open chemical reaction systems. In studying this you will realize that this movement is reactionless in that no back momentum is imparted to the field that causes this motion. For someone coming out of standard training in physics, this view of fields and engendered “forces” would likely be felt as disorienting and confusing. Indeed, it takes some time for one to change one’s ideas and paramount reality as one reads through this theory set forth in the book Subquantum Kinetics. But in the end it is worth it, at least in the present case, for it allows one to understand how a field can cause an accelerating force without any resulting reaction force. In the case of the asymmetrical capacitor considered here, the electrostatic force developed on a charged particle would arise as a result of the stress that the electric field’s potential gradient was producing on the reaction-diffusion processes that continually regenerate that particle. It is important to note that, according to subquantum kinetics, this electric field is seated in the ether and is not “mechanically” attached to the particles that generate it. Hence the capacitor as a whole is free to levitate relative to the field that it itself is producing. Since this field follows the capacitor as it levitates, being generated by the charges on its plates, in effect Brown’s capacitor pulls itself up by its own bootstraps. As to the question of how the charges on the capacitor produce their electric field, this may be understood in terms of etheron sources and sinks. Subquantum kinetics predicts that a positively charged particle should produce an excess of Y-ons relative to its environment and that a negatively charged particle should produce a deficit of Y-ons relative to its environment. This is backed up by simulations conducted on the Brusselator reaction-diffusion system, which is closely related to Model G. As a result, the Y-on concentration will be greater in the vicinity of the capacitor’s positive pole than in the vicinity of its negative pole, resulting in a Y-on concentration gradient (electric field) extending from the positive to negative pole. As a result, Y-ons will be continually diffuse from the capacitor’s positive pole to its negative pole. The point here is that through this surplus/deficit process charges are able to deploy their electric field without that field being mechanically betrothed to those charges. Moreover that field through its unbalanced effect on those charges is able to cause the capacitor to accelerate. 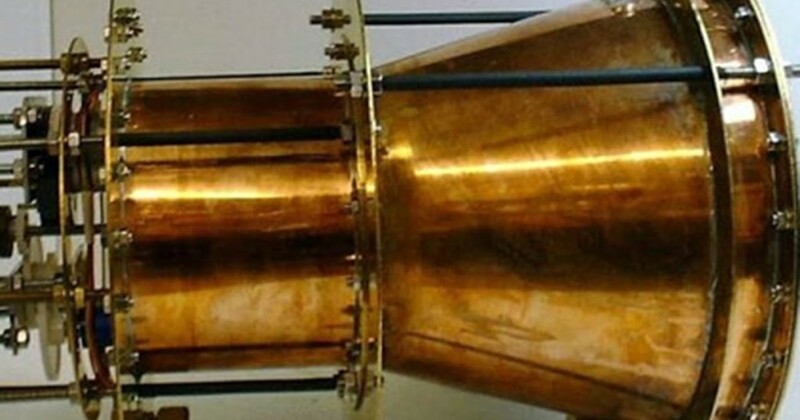 The EMDrive reactionless thruster, also known as the Cannae Drive, is a radio frequency resonant cavity which consists of a sheet metal enclosure shaped in the form of a frustrated cone that is filled with microwave radiation from a magnetron; see Figure 2 below. The enclosure is found to develop a propulsive force directed towards its larger end. Why this thruster develops a propulsive force may again be understood in terms of unbalanced forces. The cavity is filled with microwave radiation which bounces around uniformly in all directions. All surfaces are exposed to the same radiation pressure. But due to its larger area, the right end of the thruster will be imparted with a greater force than the left end which has a smaller area. Think of a solar sail. The larger the area of the sail, the greater will be the radiation force that propels it. As a result, of this force imbalance, there will be more force pushing the EMDrive cavity to the right than pushes the cavity to the left. As a result, the cavity as a whole develops a propulsive force to the right. If we understand that the microwaves in flight within the cavity are essentially electromagnetic waves carried over an ether medium and that they are not physically attached to the cavity itself, then the forces that the waves impart to the cavity walls will be relative to this ether medium, hence relative to the cavity’s instantaneous reference frame. Forces imparted to walls perpendicular to the cavity’s symmetry axis will balance one another resulting in no net sideways propulsion. But those directed on the whole along the cavity’s axis will be unbalanced resulting in a net axial propulsion to the right. Subquantum kinetics views wave motion more along the lines of Tesla’s sound wave model, except in this case they are longitudinally propagating reaction-diffusion waves of high and low etheron concentration rather than longitudinal propagating compressions and rarefactions of a mechanical ether. In subquantum kinetics these are not propagating vector force field intensities, but rather propagating electrogravitic scalar potentials consisting of an electric potential wave traveling in tandem with a gravity potential wave. Transverse field gradients in this wave, which reflect the wave’s polarization, are able to accelerate charged particles transversely to the wave’s direction of propagation. Such waves would produce forces on the walls of the resonant cavity just as would the electromagnetic force field waves of standard physics. 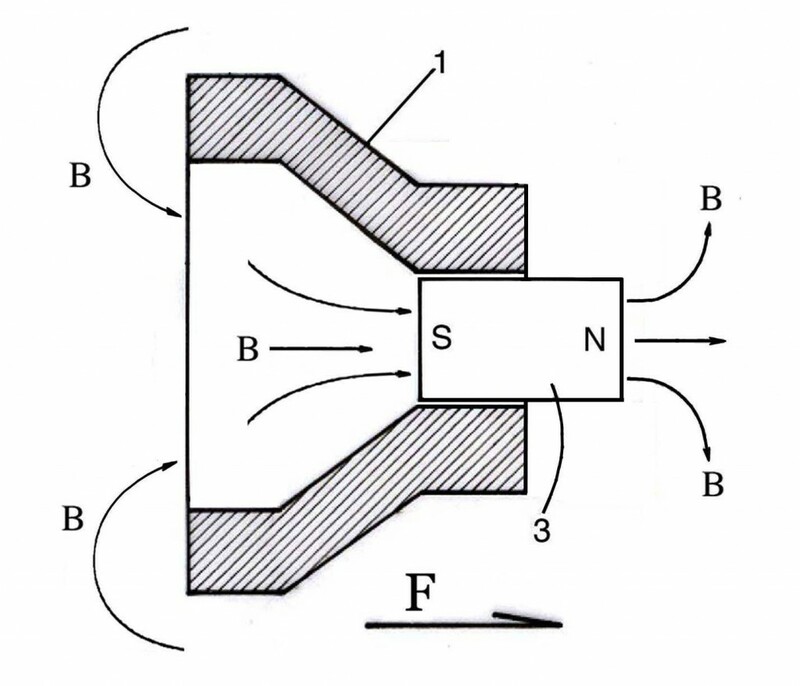 The Nassikas Thruster-I consists of an YBCO high temperature superconductor casting configured in the form of a nozzle with a permanent magnet placed in its throat; see Figure 3 below. 1) Conical high-temperature YBCO superconductor. 3) Permanent magnet 0.5 T.
When cooled below its critical temperature, the superconductor expels magnetic field lines and as a result these magnetic field lines exert a repulsive pressure on the surface of the superconductor called the Meissner effect. The magnetic field within residing within the nozzle is much stronger being close to the magnet’s south pole, whereas the magnetic field adjacent to the outer surface of the nozzle will be much weaker since it is far from either magnetic pole and hence characteristically spread out. As a result, the outward directed repulsive forces within the nozzle’s throat will be greater than the inward directed repulsive forces exerted on the nozzle’s outer surface. Due to the converging geometry of the nozzle, this results in a net force being directed toward the nozzle’s narrow end. Subquantum kinetics presumes that the magnetic field is an effect of the ether medium, in this case a vortical movement of the ether. It is not mechanically attached to the magnet that produces it. The magnet simply induces its presence in the ether. That is, the aligned spins of the atoms making up the magnet induce a vortical movement in the ether, the magnet’s magnetic field. By analogy, think of a propeller stirring water and causing it to move around in a vortex. The propeller is like the magnet and the water vortex is like the magnetic field in the ether. So this vortical movement, the magnetic field, resides in its own instantaneous reference frame and is able to propel the nozzle relative to this reference frame. This magnetic field cannot be pushed away from the superconductor through any reactive force effect because it is always being stirred up in the same position relative to its magnet propeller, hence a reactionless thrust. Using the perspective of subquantum kinetics, we here have attempted to explain the reactionless thrust phenomenon observed in three different reactionless thrusters. Hopefully, this has helped to disperse some of the mystery as to why these thrusters work as they do. Once we distance ourselves from some of the moth eaten field concepts of standard physics and consider alternative models, things begin to make more sense. While those moth eaten concepts have been shown to adequately explain many phenomena which obey Newton’s third law, they appear to be inadequate for these other technologies, in particular technologies that will help us get off the surface of our planet. Those not familiar with the subquantum kinetics paradigm are encouraged to read the book Subquantum Kinetics. Standard physics is rooted in denying non-locality and anything that smacks of space-time existing a priori energy/matter. That would allow for apparent FTL travel. In reality space/time and EM radiation are being used to change an objects density. A macro waveform outside normal space-time densities. Object can exist anywhere in that wave until it re-normalizes light years away apparently instantly. 2. Related to the above, does SQK support wave-particle duality of light? What is light in SQK, and how is it different from the light-as-a-wave idea prevalent during the “era of aether” in the 19th Century? 3. Are there any physicists apart from you that support the SQK theory? In my online research I encounter quite a few “independent researchers” whose ideas are a good fit for SQK, but they don’t even seem to be aware your theory exists. Thank you and best of luck with the Indiegogo campaign! 1) I am not aware of any conflict between explaining stellar aberration and accepting evidence for an ether, of which there is much. If you have something more about this, perhaps you could explain your reason for denying the ether on this basis. 2) Yes, I suggest you read my book Subquantum Kinetics, and this should answer your questions. 3) Of course there are many who support subquantum kinetics, physicists included. You apparently are talking to the wrong group of physicists who are among those who have not heard of it. It has not permeated all ranks of physicists. I would say that at least a million people know about subquantum kinetics, but that leaves many millions who do not know about it. It is suggested there that Einstein’s relativity is required to explain the aberration. Aether-based theories struggled to do so, to the point that by the time they got to “Lorenz contraction” they had Einstein’s relativity in all but name. Please note what I’m after is not necessarily validation of Einstein, but an understanding of how your vision of the aether differs from the “luminiferous aether” that was accepted before. I see this as key to understanding the rest of SQK and the various EM drives under consideration, including Nassikas. Stellar aberration is proving particularly difficult for me to comprehend. The falling rain analogy is not convincing. I was hoping you may have some detail on this phenomenon that would help settle the matter. At any rate, it’s clear I have more study to do. The nice thing about the ether physics of subquantum kinetics is that relativistic” phenomena such as the Lorentz contraction, clock retardation, gravitational clock retardation and gravitational mass increase all drop out as corollaries of the basic equation system. Hence they need not be postulated ad hoc as Einstein did with his space-time theory. Ironically, they are derivative from the subquantum kinetics ether concept. This is not like any of the mechanical ether concepts. Subquantum kinetics is based on the reaction-diffusion ether concept. It turns out that this type of ether can predict these effects where other theories failed in the past. This is all explained in my book Subquantum Kinetics. Dear dr Paul Laviolette i really can’t fathom the stubborness and blindeness of the standard paradigm and its denial to accept its failure. They always come up with a new fantasy concept to cover it up… . Thank you for this beautiful, indepth article. Truth is you need to reda it two-three times to really understand the concentrated wisdom that is presented.